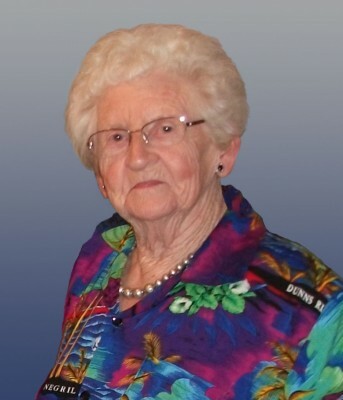 It is with sadness that we announce the peaceful passing of our mother Anne Reiger, aged 89 years, at Evanston Grand Village in Calgary AB on December 16th, 2015. Anne was born in Grenfell, Sask. on February 15th 1926 to Clara and Frances Redman. She spent her early years in Alberta and Manitoba before moving to Grenfell where she started school. After high school she moved to Regina working at a doctor’s office for a while and then attended “normal school” to become a teacher. In 1946 the war was over and a handsome soldier returned to Grenfell. Jack proposed shortly after they met and they were married a year later on Anne’s 21st birthday, Feb. 15th 1947. Anne taught in many one room schools and later worked in a medical office and then started teaching at Success Business College in Regina. Her last career move was as school secretary and librarian in Young, Sask. She continued working until age 65, all the while managing to look after Jack who had been injured in a car/train accident several years earlier. She was very busy giving back to their community in her roles as secretary, treasurer and president of many organizations. She was also very involved in politics. After Anne retired, her and Jack spent the month of March in Victoria or Kelowna to get away from the harsh Sask. winters. They both loved to travel so had gone to Europe, Argentina and the U.S. After they bought a motorhome, Anne was always planning the next trip, be it to Newfoundland, the Maritimes, B.C., Alberta or NWT. She loved her family, dancing, music, curling, and watching football and hockey. After Jack moved into the Manitou Lodge, Anne also moved to Watrous to be close to him. She faithfully visited him daily, but still found time to go out for dinner with her friends. After Jack died Anne moved to Alberta to be closer to her children. She leaves to mourn her daughter Heather (Guy) Kerr; son Robert (Joanne) Reiger: grandson Shawn (Holly) Evans: great grandson, Xianen; great granddaughter, Harper and grandchildren, Chris and Myrena Reiger. She was pre deceased by her husband Jack in 2010, her parents, her brother Arthur and all 13 of her half-brothers and sisters. Heather Kerr and Robert Reiger will give the eulogy. Interment to follow at the Grenfell Cemetery. A lunch will be served at 3PM in the Legion Hall. A Celebration of Life tea will be held at the Young Seniors Center on January 6th , 2016 at 2:00 P.M. In lieu of flowers, memorial donations to the Salvation Army or a charity of your choice would be appreciated. Cochrane Country Funeral Home and Tubman Funeral Home are in care of the arrangements. Heather and Robert, I just wanted to take a moment to send my deepest sympathies to you and your families. Anne and Jack are both a big part of my childhood memories growing up in Young. The school was never quite the same with out her their either. My dad Russ Deneiko always spoke very fondly of Anne, and was also sad to see her retire! All my memories and visits, even Jack teasing me when I has little will be cherished!! It is never easy to say good bye to a loved one. It doesn’t matter how long we have them, we don’t want to see them go. I would also like to apologize in advance, that I am unable to attend the memorial tea on January 6th as I have appointments that can’t be cancelled.